Looking for hourly invoice templates? We've got you covered! Do I need more than just an hourly invoice template? Charging someone hourly for services can be pretty complicated, especially when you're dealing with multiple projects and multiple clients, but we're here to save you precious time and energy. ZipBooks offers much more than just a generic free hourly invoice template. 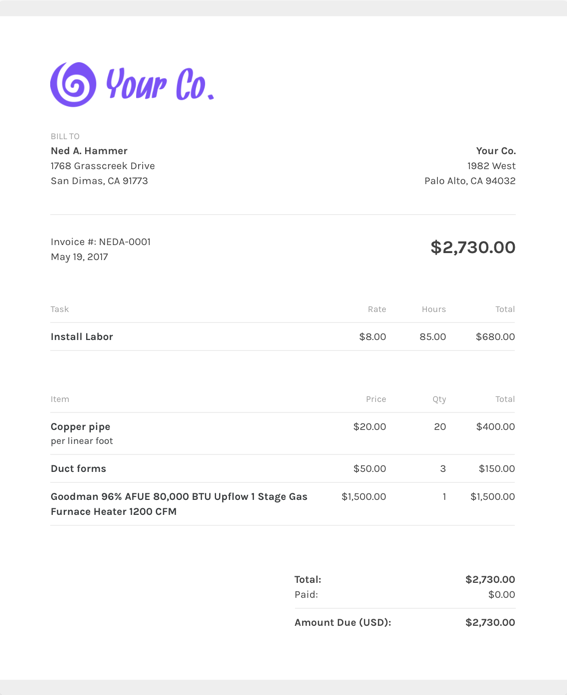 We have a time tracker that connects directly to our invoicing, so you don't have to do any math at all. Just use the time tracker, label each project, and it will be automatically drawn in when you create an invoice for that project. Check out what else we can help you with below. What should I include on my hourly invoice template? One innovative selling point about ZipBooks is that you can pre-enter all the details of your invoices into the invoice template. Using ZipBooks for your hourly invoice means never sending off an invoice without your own company information on it (oops!). We’ve collected data from tens of thousands of invoices and use it to score your invoice based on what information you include so you’ll get you paid faster. Why should I use ZipBooks’ hourly invoice template to create and send my hourly invoice?